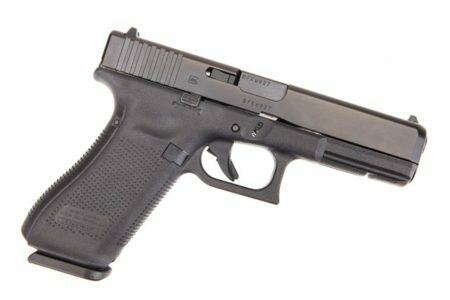 Glock 19 Gen 4 Review 2019 - Is This Pistol Worth The Money Today? The Glock 19 Gen 4 comes from a reputable manufacturer, known for pushing the envelope with each new model. 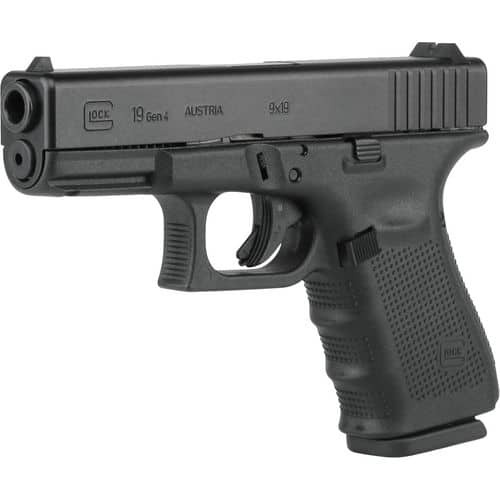 Ever since the establishment of the company in Austria in 1963, Glock has been synonymous with quality and reliability. Its steady growth coincided with the Glock brand being used both by police and military forces, as well as in commercial settings. The first Glock 19 came out way back in 1988, and each new model has won universal acclaim. This model is no exception, and we are pleased to report that it indeed delivers on its promises. The release of the original Glock 17 model was a revolutionary event. 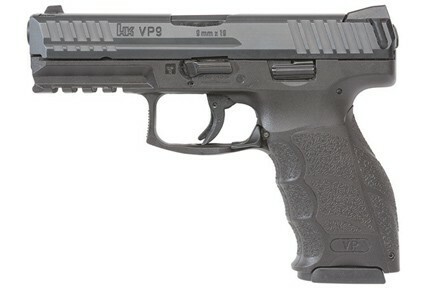 This so-called plastic handgun surpassed all expectations in terms of sales. Each following model brought improvements and modifications to the faithful Glock enthusiasts. So, with the release of Glock 19 Gen 4, back in 2010, it quickly became a new standard in law enforcement and personal protection. 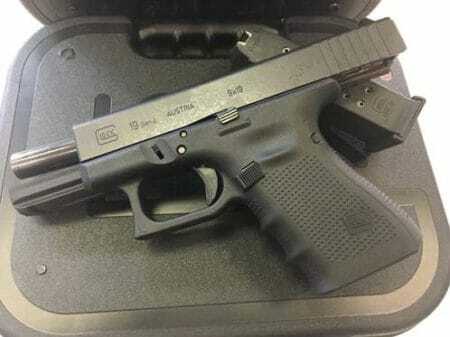 The Glock 19 Gen 4 is a powerful, accurate, no-frills semi-automatic handgun. 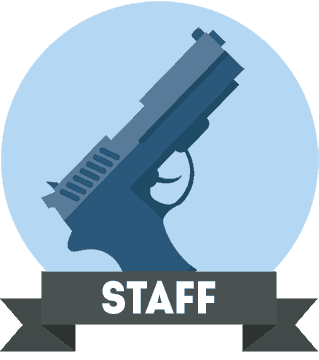 The fact that it comes from a brand whose models have become standard equipment of professional law enforcement also makes it a very good choice for your personal protection. With a caliber of 9 x 19 mm, this model is 7.28 in long and 1.18 in wide. Unloaded, it weighs 23.65 oz. The standard magazine capacity of the Gen 4 is 15, although there is an option of fitting in the 10/17/33 variant. Namely, all Glock magazines are the same size (width). Therefore, it is possible to fit a larger one in this handgun. This model features a new addition – the dual recoil springs. 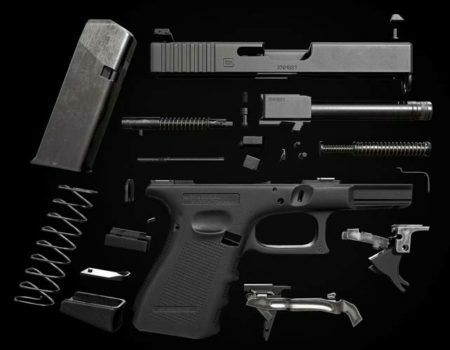 Glock has introduced the dual spring so as to lessen recoil and build more durable parts. The handgun trigger pull weight is 5.5 lbs. We consider this to be ideal for a serious handgun – falling right between 4 and 6 lbs, hence making it not too light, but also not too heavy. The package comes with three 15-round magazines and a practical speed loader. Also included: a wire brush, four back straps (grip panels), gun lock, and, of course, the owner’s manual. 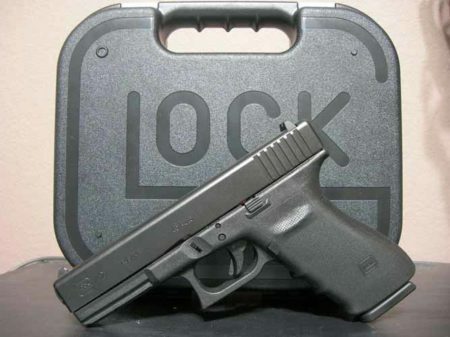 Last but not least, like all Glock models, it comes in a hard case, which all gun enthusiasts rightfully appreciate. The Glock 19 has a cold hammer-forged barrel and utilizes a matte black nitration finishing process. Its frame is made of reinforced polymer. The fact that the frame uses plastic as the main material may turn off some folks. However, do not let that fool you – the material used here is, well, indestructible. For ease of use, the front side of the frame has finger grooves which come in very handy for using the pistol in any kind of weather. In addition, it has a steel barrel and a black melonite slide finish. First of all, this model, with its 5.5 lbs trigger pull weight, is a very user-friendly weapon. We have found it to be accurate and, most importantly, it is built in a way to never fail you. That is, of course, something we all look for in a pistol. 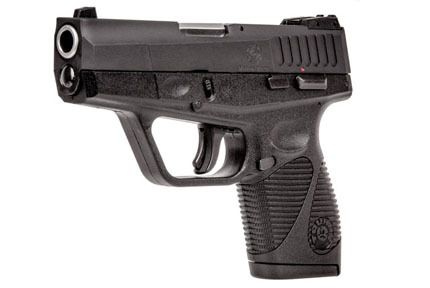 As a standard, the Glock 19 Gen 4 uses polymer “U” dot configuration sights, which are rear adjustable. We have found it to be quite sufficient, although some experts advise replacing the plastic sights with iron sights for better precision. 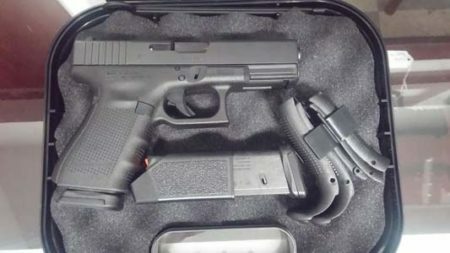 As for safety features, this model comes with Glock’s proprietary Safe Action system – three automatic safety measures. Thanks to the modular back strap design it uses, you can adjust and customize the Glock 19 Gen 4’s handle to fit your grip. Mind you, with the alteration, the grip angle will remain the same. That way, you will enjoy maximum comfort, which also translates to safety. Namely, not worrying about anything else while operating a weapon is imperative. 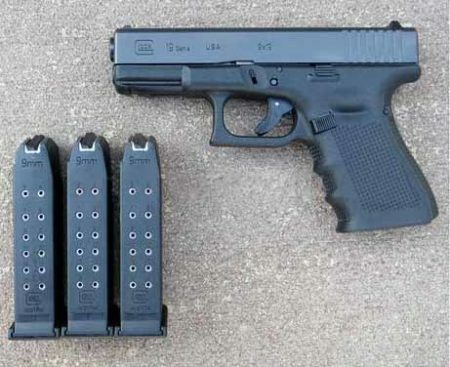 Some users have complained about the Glock 19 Gen 4’s bulky, no-frills design. However, even if you’re a fan of flashier pistols with a bunch of add-ons, consider the fact that Glock has opted for this look for a reason. Namely, by removing everything that’s not absolutely necessary, you get a weapon that you can absolutely rely on at any given moment. As we have grown accustomed to when it comes to Glock models, the magazine can be effortlessly removed, even after long periods of use. Retracting the slide is also not a problem – a quick pull of the take-down lever will do the trick. After that, the recoil spring assembly and barrel can be removed. The procedure is not difficult to repeat, and you will be good to go. Also, in terms of regular maintenance, this model will need the occasional greasing; however, not as much as some other handguns. So, in that regard, too, it’s rather user-friendly. Glock is famous for its massive aftermarket. With the numerous options available for additional purchase, you will truly be able to enjoy the Gen 4’s modular features and make it an ongoing project. Bear in mind that previous experience with firearms is more than welcome when considering handgun modification as your next hobby. But, if you choose to do so, the sky’s the limit. Some of the add-ons available include night sights, trigger connector bar, and an aluminum magazine catch which will make things even faster. Depending on your location and other factors, you can purchase the Glock 19 Gen 4 for under $600. Considering the sheer quality it brings to the table, this is truly a good deal for any handgun enthusiast. The New York Police Department has been using this pistol as part of their regular equipment for years. This fact alone speaks volumes about the Glock’s reliability. If you are looking for versatility – well, look no further. The Glock 19 Gen 4 is a great choice both for professional law enforcement, as well as personal protection as a concealed-carry piece. Add to that the fact that all relevant testing has shown that this pistol shows no signs of wear and tear, even after 1000s of rounds. Overall, the Glock 19 Gen 4 performs very well and that's the reason it's so popular. We were very impressed with this!